Standing before a diverse new class of House Democrats, in the shadow of their new female speaker, President Trump showed on Tuesday how he plans to govern in a divided Washington. The answer, judging by his words, is no differently than he did before. 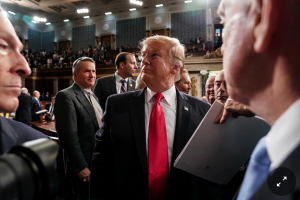 Mr. Trump briefly acknowledged Nancy Pelosi as “Madam Speaker,” but dispensed with even perfunctory congratulations. He ignored the midterm elections that swept the Republican Party out of power in the House. And he vowed that the United States “will never be a socialist country,” likening the progressive Democrats in the chamber to the discredited leader of Venezuela. The president did issue a call for bipartisan cooperation, and he invoked the heroism of World War II to celebrate a shared history. But on the issues that have rived Washington during Mr. Trump’s turbulent presidency, he did not give an inch.